Batavia, New York - In 2018, under the direction of the Alumni Affairs Office, the Nursing Program Alumni at Genesee Community College established a Nursing Alumni Scholarship to ensure every qualified Nursing Program student can and will succeed. 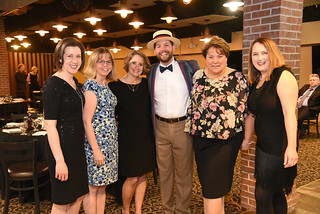 To generate funds for the scholarship, the Nursing Program Alumni committee will throw a luau in the College’s Richard C. Call Arena on Friday, May 10, 2019 at 6 p.m. Since Nursing is a profession the entire community relies on, the entire community is invited! The 2nd Annual Nursing Alumni Gala – themed a luau - will include dinner and dancing and chances to win big with door prizes and a cash raffle! Tickets are only on sale until May 3, 2019 – so contact the Alumni Affairs Office at alumni@genesee.edu today. You can also get your tickets and RSVP online at https://www.genesee.edu/home/offices/alumni/alumni-events/nursing-fundraiser/. Tickets cost just $30 per person and all proceeds go directly to the GCC Nursing Alumni Scholarship. In addition to attending the luau, there are opportunities to sponsor the scholarship at a number of levels. The sponsorship opportunity detail is available at https://www.genesee.edu/home/offices/alumni/alumni-events/nursing-fundraiser/ and includes commitments of $100 - $3000 and includes In-kind Support for those wishing to customize their sponsorship. All sponsorship levels include a variety of benefits from free advertising to photos, and GCC Foundation recognition. All sponsorships must be submitted by April 20, 2019 for full recognition. The Nursing Program Alumni committee includes: Michelle Grohs, Committee Chair, director of Surgical Services, Maternity and Women’s Health at Wyoming County Community Health System; Susanne Roggow, Spectrum Human Services nurse; Stephanie Durfee, GCC Nursing Program instructor; Laurel Sanger, GCC’s director of Nursing Program; Maureen Spindler, GCC’s visual communications specialist and photographer; Scott Gardner, president of the Wyoming County Chamber of Commerce; Jennifer Wakefield, GCC’s assistant director of Alumni Affairs; Nancy Rogers, MS, RN-BC, CNE, CASAC, Clinical Nurse Specialist, Comprehensive Psychiatrist Emergency Program (CPEP), Erie County Medical Center (ECMC) and ECMC nurse; Maxine Ferringer, Staff RN, Strong Memorial Hospital Surgical Center/23 hour unit, and full time PhD Student, University of Rochester School of Nursing; Shari McDonald, Vice President Chief Nursing Officer at Mercy Hospital of Buffalo; and Dan Ireland, CEO of United Memorial Medical Center. For more information, contact Assistant Director of Alumni Affairs Jennifer Wakefield at (585) 343-0055 ext. 6265, or via email at jgwakefield@genesee.edu.